The Bhagavad-Gita attempts to reconcile the two types of Hinduism (worldly and renunciatory) by offering a third way. This third way entails worshiping lesser gods, who emanate from the Supreme Brahman. An example of a lesser god is Krishna, the human hero who is worshiped as an avatar, or earthly descent of the god Vishnu. 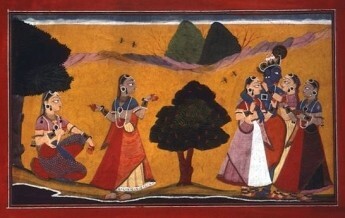 He is depicted here in Krishna with His Maidens, a 17th-century painting in the book Rasamanjari by Indian writer Bhanudatta.